TYLT have always been a good choice for products. The reason for this is the fact they spend a lot of time talking to customers, and working out what people actually need and then deliver those products to an incredibly high standard. We are now coming up to the Christmas period, and TYLT have released a couple of nerdy stocking fillers that are definitely worth a look. 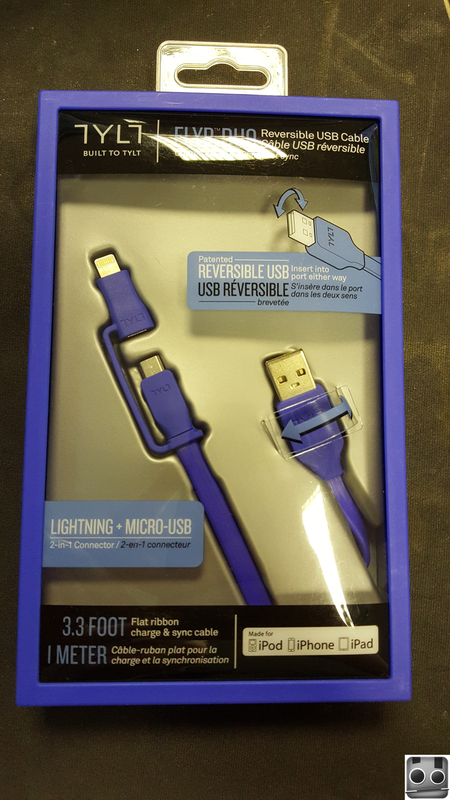 We have two of those products in house that we will look at today, the first is the FLYP-DUO which is a reversible USB cable. It has a micro-USB connecter that can quickly become a lightning cable just by applying the attached cap. The second product is the Y-CHARGE [QUIK], this is a dual USB car dock, which enables the charging of two devices, and uses quick-charge technology. There are those who only use Android or Apple products exclusively, but nowadays most people have a mix of both devices in their home, and as you can imagine, that’s a lot of cables and chargers. Being someone who uses both I was really pleased to see the FLYP-DUO, not only is it a reversible USB connection, it is primarily a microUSB cable, with a lightning adapter connected to it allowing me to use one cable to charge both Android and iOS devices. In testing I found no issues with charging or transferring data with either connection and I was pretty thorough. The testing was done by using a file of the same size on an Android and iPhone and timing the transfer time, I first used TYLT’s cable and then used the individual cables for both devices. Overall there may have been a few seconds difference but nothing that would cause any issues. Charging time was tested by reducing the devices to 50%, then timing the time to charge it to 60%, then doing the same test with each phone’s individual cable. Again there was a few seconds in it, but I felt that was acceptable if it meant I would only have to use one cable as opposed to two. If you are driving a slightly older car, you may not have the pre-installed USB charging ports now being used. So with the release of all the latest handsets we have found that people have to charge more regular, especially when in the car. If you often find yourself in this situation then the Y-CHARGE from TYLT may be for you, essentially it is a 2 port usb car charger, which goes into the cigarette socket in your car. When plugged in it provides you with two USB ports to charge your products. 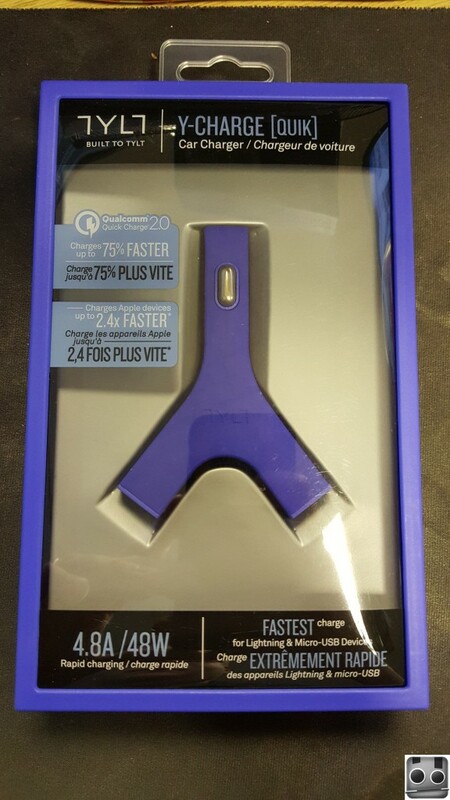 Now not only does it look good with its blue/purple soft colour and material, it now supports Quick Charge 2.0. This means that products that support it, can be charged 75% faster, through your car! It can also charge your Apple devices 2.4x faster. Testing the charging capabilities I was blown away. I was able to charge two S6 phones from 0 to 100% in just under 2 hours, which when testing on a the included AC Quick Charge charger, 0 to 100% took just under 1.5 hours. So there is a slight difference but still I was super impressed. Both of these offerings are available now, and could be awesome gifts for anyone who love tech. Though I would never of thought to look for one of these, I would be more then happy to get given one for christmas, I think they are incredibly useful and good value. You can check both the products out by clicking the links below.